Customer Service and Support « Global Market Insights, Inc. 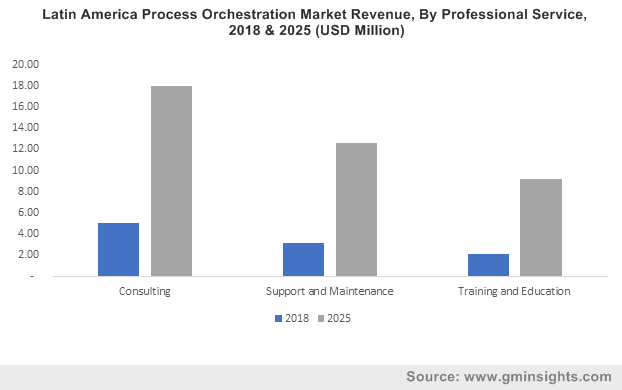 The surging adoption of advanced technologies along with rising globalization trend will propel the process orchestration market growth in the years to come. Businesses nowadays are primarily focusing on reducing production cost, improving operational functioning, gaining enhanced competitive skills and delivering improved customer satisfaction to clients, functions that can be fulfilled by means of adopting process orchestration. The technology effectively helps design, implement, integrate and monitor customer process applications and integration scenarios more quickly and flexibly, helping businesses innovate faster and respond to changing business demands more efficiently. Speculating the technique’s profound benefits, companies are now investing in developing innovative solutions for transforming their businesses and to deliver unique customer satisfaction. For instance, in 2018, around 55% of the start-ups adopted digital business strategy, while around 85% intend to invest in digital transformation in the future. Moreover, major sectors include energy & utilities, retail, manufacturing, healthcare, IT & telecom are also adopting process orchestration solutions for improving business efficiency, that would quite overtly expedite the industry growth over 2019-2025. With the increasing adoption of advanced technologies such as AI and machine learning, the demand for process orchestration solutions to efficiently manage, integrate, and optimize computer systems and cloud architectures to further help serve and retain customers has only been surging. The deployment of the cloud has also been of concern to numerous businesses as their data and information is located in off-premises servers, making the adoption of process orchestration vital for managing cloud-based application and services. Speaking along similar lines, it is prudent to mention that the process orchestration market has been depicting quite some growth from the deployment of the cloud. Cloud-based process orchestration services help in simplifying deployment and centralizing automation processes, making it easier for expanding and transforming processes at a lower cost and at a faster speed. Given the cloud’s off-premise feature, orchestration brings dependency management, high availability, failure recovery, scaling and numerous other tasks and attributes all into a single process, significantly reducing staff effort. The rapid growth and adoption of cloud solutions across SMEs are thus contributing majorly to the expansion of cloud-based process orchestration industry. Enumerating the application landscape of the process orchestration market, the retail & consumer goods sector is anticipated to emerge as a pivotal avenue for this industry. With increasing market competition and rapidly evolving consumer needs, it has become vital for the retail sector to improve its service offerings. Process orchestration solutions will enable such businesses to transform their operations and enhance customer reach, and will also help in automating manual processes, minimizing operating costs, improving customer shopping experience and identifying new revenue streams in the highly competitive sector. This in consequence would majorly accelerate process orchestration market share from retail & consumer goods applications, slated to depict a CAGR of 14% over 2019-2025. Speaking of the regional terrain, it comes as no surprise that the Asia Pacific region is primed to evolve as a highly competitive ground in the years to come. The key factors contributing to market demand across the continent include rapid globalization, increasing demand for industrial automation and strategic government initiatives targeted towards the manufacturing sector. The growing awareness regarding process orchestration benefits, such as the elimination of process redundancy and enhanced business planning, will act as a driving factor for APAC process orchestration industry. Powered by the increasing use of IT infrastructure and resources to gain cost optimization, APAC process orchestration industry share will register the fastest growth rate of 18% over 2019-2025. Proliferation in the retail sector coupled with the integration of advanced technologies, such as AI and machine learning will contribute to the growing adoption of process orchestration. Businesses are continuously launching newer products in the market to meet the growing customer requirements, further driving market growth. The growing demand for cloud technologies is also contributing to the process orchestration industry growth. According to Global Market Insights, Inc., the process orchestration market size will exceed $9 billion by 2025. This entry was posted in Sustainable & Smart Technologies and tagged BFSI, Cloud, Consumer Goods and Retail, Customer Service and Support, Energy and Utilities, Finance and Accounting, Global Process Orchestration Market, Healthcare, HRM, Human Resource Management, IT & Telecom, Large Enterprises, Manufacturing, Media & Entertainment, On-Premise, Process Orchestration Market, Process Orchestration Market Forecast, Process Orchestration Market Growth, Process Orchestration Market Research, Process Orchestration Market Trends, SCM, SMEs, Supply Chain Management, Transportation.